“Why Apple Should Start Making a 3D Printer Right Now” « Adafruit Industries – Makers, hackers, artists, designers and engineers! Why Apple Should Start Making a 3D Printer Right Now – Ross Andersen – Technology – The Atlantic. And that’s what makes Brendan Dawes such an interesting early adopter. For one, he’s kept meticulous records of his productions since he bought his MakerBot Thing-O-Matic from Makerbot Industries, a company that sells stripped down do-it-yourself 3D printers directly to consumers, in December 2010. Over the past year he has posted his “printings” on a tumblr called everythingimakewithmymakerbot. The site reads like a diary or sketchbook; an intimate account of a creative person interacting with a new technology. 3D printing is sort of where personal computers were in the ’70s – they work, but it still takes a lot of fiddling and tweaking to get it to get good results. Ambient temperature must be just right, extruder heads need to be rebuilt, and maybe tear it apart and add a heated platform so your project doesn’t warp. Also, the article doesn’t really make the point to which their own title alludes. Why should Apple be the one to do it? Why not (insert any other tech company name here)? What an insult to Makerbot to deface their machine with such tacky iWhatever styling. He also seems to be under the delusion that a company like Apple would benefit the 3D printing community. Makerbot’s embrace of open-source and hackability are completely at odds with the Apple of today. If he’s trying to invoke hazy memories of the 1970’s computer scene, then in what way would the involvement of a mega-corp, obsessed with closed-source and patents, help foster such an innovative field? great. apple can buy up a ton of ip, release a printer, then sue everyone in sight. just what the world needs. Wow, looking through Keith’s blog, it is amazing to be reminded how fast things are changing. I got my Cupcake in Feb 2010, with much the same setup as Keith’s blog shows, but the MakerBot MK4 extruder design he blogs about dealing with is now considered completely terrible, only 2 years later. MakerBot has improved the design of the whole bot very dramatically, and units from competing companies are now equally improved. The fiddle factor is still there, but failures are a lot less common now than for those beating their heads on the older hobby printers. 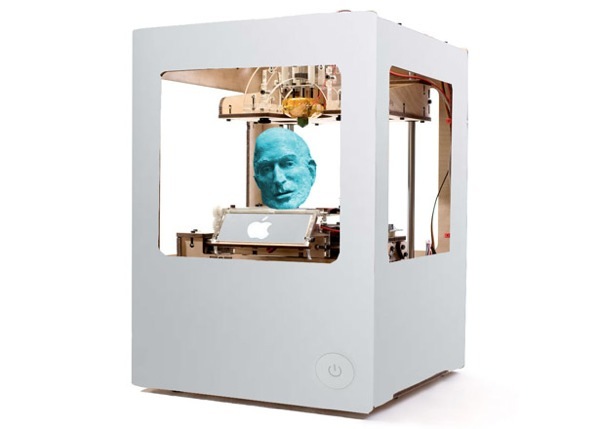 If Apple made a 3D printer, they would make sure you could only use their 3D modeling software (iModel ? ), you could only download models through iTunes, and if you sold your models they would take 30+% and if you tried to do your own thing with it jalbreaking it would be necessary. I think we can do without Apple at the moment. I agree with Dan, the last thing we need is the modern day Apple to get involved. In the past decade, my reaction to Apple entering a given field is that the hype will validate the field, but innovation and competition will be killed dead. With the advent of Android things are a bit better, but still problematic. I’ve got an idea, why don’t the companies who started out build the field and become the next Apple? For those worried that Apple would create a closed ecosystem for 3d printing, I give you the Cube from 3D Systems. Behold and despair! In all seriousness, though, I would welcome an Apple 3D printer–not because I would necessarily want to use it (I like my Thing-O-Matic) but because it would most likely mean that the desktop manufacturing revolution had arrived in earnest. My ToM is numbered in the 6000s. Apple sells more than that many iPhones every 30 minutes, day and night. At iPhone levels of market penetration, just the sheer number of 3D printers out in the wild would all but guarantee runaway innovation, even if 90% of those printers were somewhat crippled. In short, I want to see the desktop manufacturing revolution happen, and I’m not too concerned who gets rich in the process (since it probably won’t be me 🙂 ). Woo, lots of comments on this thread. I really didn’t make my original point very well. Desktop manufacturing is a very populist movements – let’s give the tools of manufacturing to the people. It seems to hold personal freedom and independence as core values. Why buy what you can make yourself? These are not the same core values that Apple has. I think Apple instead wants to create fantastic user experiences by tightly controlling the whole chain. And while I don’t think that this is necessarily an explicit goal, there is currently a culture of people “needing” the latest Apple devices. Why would a company that makes their money from closed ecosystems and a regular product obsolescence cycle want to give people the tools to build their own things?